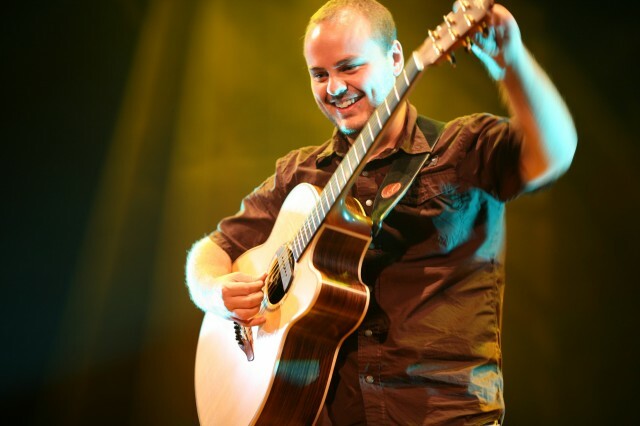 Andy McKee is one of the world’s finest acoustic soloists. After receiving hundreds of millions of views collectively on the internet for his guitar performance videos which were originally posted on YouTube by the independent record label “Candyrat”, Andy’s success is a testament to the changing nature of the music industry as well as people’s desire for something new and interesting to listen to. At one point, Andy held the #1, #2 and #3 positions for Top-Rated Videos of All Time on the hugely popular website. His videos are still among the highest rated on Youtube. Consequently, Andy has performed to sold out shows all over the world. After starting with an interest in electric guitar, Andy turned to the acoustic guitar at the age of 16 and began enjoying and studying the music of Michael Hedges, Don Ross, Billy McLaughlin and Preston Reed. To this day he still sites these four musicians as his primary influences in acoustic music. At the same time, Andy draws inspiration from various other musicians and groups such as; Earth Wind and Fire, The Yellowjackets, Bjork, Imogen Heap, Pantera, Eric Johnson, Peter Gabriel, Dream Theater, Bruce Hornsby, and many others. While there are countless amazing guitar players in the world, it is Andy’s attention to song structure and melodic content that elevates him above the typical guitarist. It can be observed that Andy likes to try different things with the guitar such as; altered tunings, partial capos, percussive hits, and tapping. But in the hands of Andy these are not mere parlor tricks, they are compositional tools used to create some of the finest crafted music for the steel string acoustic guitar. Andy was born in Topeka, Kansas. He performs between 100-200 shows annually across the world.